Take the mini-SATs test here. Organise your own Big SATs Sit-In, find the toolkit here. We know the negative effect that SATs have on our children’s education. Rather than enjoying a stimulating, varied curriculum, pupils (aged just 10 and 11), spend almost a year preparing for pressurised tests in English and maths. But do you know how absurd some of the questions are, and how little time pupils have to answer them? Now’s your chance to find out! On Wednesday 5 December, we’re holding a Big SATs Sit-In. It’s a series of events across the country where grown-ups will take SATs papers — under exam conditions! — and spread the word about what’s wrong with the current system. 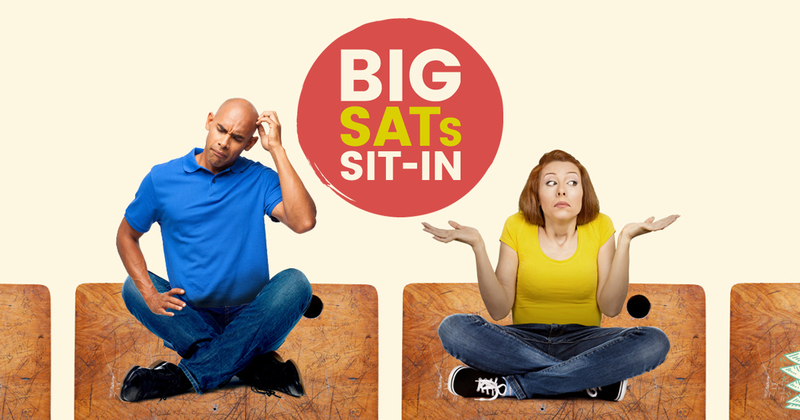 In the run up to the Big SATs Sit-in, you can also try our mini SATs test to see what you think of the questions. You’ll find it hard to believe that this is what Year 6 pupils and their teachers spend almost a year preparing for. Would you like to take part? There are lots of ways to get involved. You can join us in London or Stockton-on-Tees where a large group of supporters will be sitting the papers. You can host your own event. It can be as large or as small as you would like, and you can host it anywhere from a community centre to your own kitchen. We’ve put together a guide showing you how to make it happen. Spread the word! Share our Facebook post. We hope you can join us. Together, we can make our voices heard: our children are More Than A Score! © 2019 More Than A Score. All rights reserved.